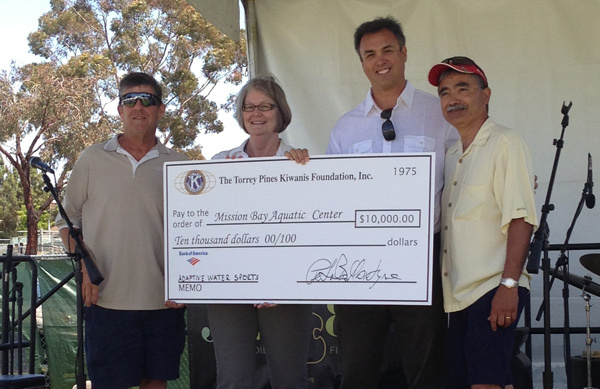 The Torrey Pines Kiwanis presented a $10,000 check to the Mission Bay Aquatic Center to purchase accessible equipment and to support watersports for persons with disabilities. The presentation happened at last month's La Jolla Arts Festival, whose proceeds from the event support athletic programs for persons with disabilities throughout San Diego. The check was presented by Festival Executive Director, Ted Pena, along with Foundation President, Peter Balantyne, and City of San Diego Council President Pro Tem Sherri Lightener (pictured above). Councilmember Lightner was as at the festival to provide the Torrey Pines Kiwanis Foundation with a proclamation declaring June 22, 2013 as La Jolla Festival of the Arts Day in San Diego.